It is important to note that we will no longer be relying on the ctmrinfo.customerID engagement attribute to indicate whether the user is authenticated or not. This engagement attribute will still be used but just as a regular engagement attribute. LiveEngage monitoring services will be using the new function below to identify if the user is authenticated on each page and not in a session based manner as it was previously. 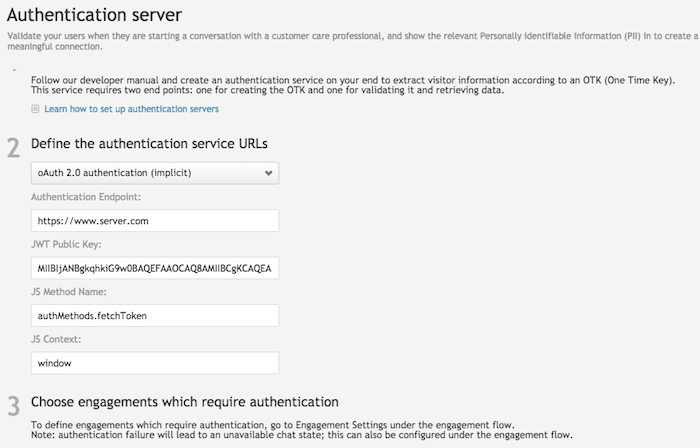 When migrating from using the cutomerID engagement attribute to the new Identity function please contact your LivePerson representative to complete the migration. In order to enable targeting for messaging engagements (authenticated and unauthenticated web messaging), the identity of the consumer must be passed to the API using the identities array and identity function. The information in this array should match the values assigned to the user when they authenticate on your site; this information is not used for visitor authentication, but as a trigger to LivePerson monitoring services to start targeting and sending relevant engagements and/or notifications to the visitor. In essence, this information identifies rather than authenticates a user; it passes unique information to LiveEngage, allowing for targeted engagements and continuity between conversations to apply according to the information passed. The identity function should be implemented on every authenticated page (the LivePerson tag will set the identity of unauthenticated visitors). // Initialize the lpTag namespace and the identity array, if the identity function is placed above the tag. All 3 object keys are mandatory. iss - Issuer, who identified the consumer - usually the brand. Any alphanumeric string value is accepted, meaning that this value is arbitrary and can be set entirely by the brand according to their own needs and specifications. acr - Authentication Context Class Reference based on NIST-2 (2013), the level of the authentication. Currently, we support the level loa1 only and thus only it should be used in this context. sub - unique and non-guessable identifier of the consumer as set by the brand on their website. This is used to identify returning users and immediately continue an open conversation (email and phone number are not good candidates since they can be guessed by an attacker, and might be recycled and moved between consumers). For more information on these keys, please see the Monitoring API documentation. After attributing the conversation to the customer identity, any new incoming messages will be delivered and displayed to the consumer as a window in a minimized state, with new message notifications. token - a string token. Alternatively an object can be provided containing 2 properties: "ssoKey" - a string token, and "redirect_uri" - a string URI (relevant for embedded code flow only). The Customer web page method name can be either the default LivePerson method name (lpGetAuthenticationToken), or any specified name which can be accessed by traversing the global scope on the page. The token (JWT) should contain three base64url encoded segments separated by period ('.') characters. The following HTTP headers are required: header name: “Authorization" The value contains the standard basic authorization header [RFC2617], based on client_id:client_secret provided by the team to identify. "extended claims set  - ref: OpenIdConnect token structure"
sub The consumer ID of the authenticated subscriber. iss The name of the Authorization Service as configured in LivePerson. The id_token will be signed using RS256 ALG (see http://jwt.io) [RFC 7519], and the public key for verifying it will be supplied to LivePerson during the configuration stage. unauthorized_client The token was valid, but this subscriber is not authorized to use the messaging feature. Note that this should not be encountered in the production environment, as the check is performed on the client before the LivePerson SDK is invoked. LivePerson supports the following claims set, which will be displayed to the agent after successful authentication. Custom Claims will be added in LP SDE form from the SDEs list, see the Engagement Attributes Overview document for more info on the possible Engagement Attributes. (Please note that some Engagement Attributes are NOT supported in an authenticated flow. Please see the document for details on which attributes are supported and which aren't). 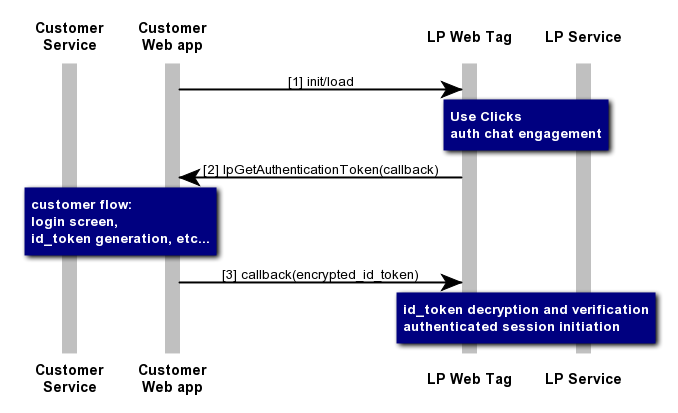 In order to encrypt the JWT payload, use a public key supplied by LivePerson. The encryption should use RSA algorithm. JWE header should include header name “alg" with the value: RSA_OAEP_256. The public key should be added to LivePerson OAuth configuration in the “JWT Public Key" field, and should be base64 encoded with X509 key spec. Wrap text of code to be structured as continuous line (remove any new line char).